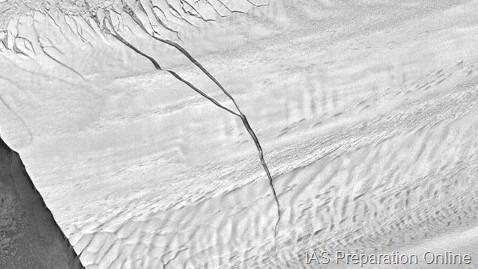 A new, huge iceberg is expected to break off the Pine Island Glacier in Antarctica, once a newly discovered crack reaches the other side of the glacier’s ice shelf. The crack was 18 miles long, 260 feet wide and from 170 to 200 feet deep, according to scientists who flew over the glacier’s floating tongue on Oct. 14. A new Earth Observatory feature on the crack says scientists are unsure when the huge piece of ice will break off, but an absence of nearby sea ice during the southern hemisphere’s springtime could hasten its detachment. “Sea ice acts as a buttress or a damper to sea swell, protecting the front of these ice shelves or glaciers from calving,” explained NASA glaciologist Kelly Brunt. “So the fact that there’s no sea ice in front of Pine Island Glacier right now implies that it might be primed to calve.